Kickstarter projects pop up all of the time. Developers are looking to raise money for their projects so they can order a larger production run and gauge market reaction. A lot of recent projects are trying to address the “Maker Community” by making it easier to prototype connected devices and sensors. We just found one called, “nodeIT” from Sweden. The nodeIT is centered around the ESP8266 Wi-Fi microcontroller and allows you stack other boards to extend its base functionality. Once the nodeIT is connected to your Wi-Fi network, you can easily publish data to ThingSpeak and visualize the results, such as data collected by a barometric sensor. For more information about nodeIT, follow their Kickstarter campaign and check out their ThingSpeak Room Monitor project. The sensor records the PM10 and PM2.5 dust levels to get an accurate indication of the dust in the air. This project is a great example of how a little sensor could turn into something important for protecting machine shops, construction sites, and garages. [Vegard Paulsen] created a solder iron that reports its usage and temperature to ThingSpeak and alerts him when it was left on. He uses an NodeMCU / ESP8266 Wi-Fi module to collect the data and post it to his ThingSpeak channel. Once the data is on ThingSpeak, he is able to send push notifications to his phone using the ThingSpeak React App. The data pushes out to the ThingSpeak server which handles pushing data out to the bigger network, and data representation (like the cool Google gauge…). The best part: [Vegard] gets a phone notification when he accidentally leaves his soldering iron on. How perfect is that? That looks a lot like our desks… wires, microcontrollers, pliers, cutters, Wi-Fi modules, and soldering irons. And now, the soldering iron is on the Internet of Things. 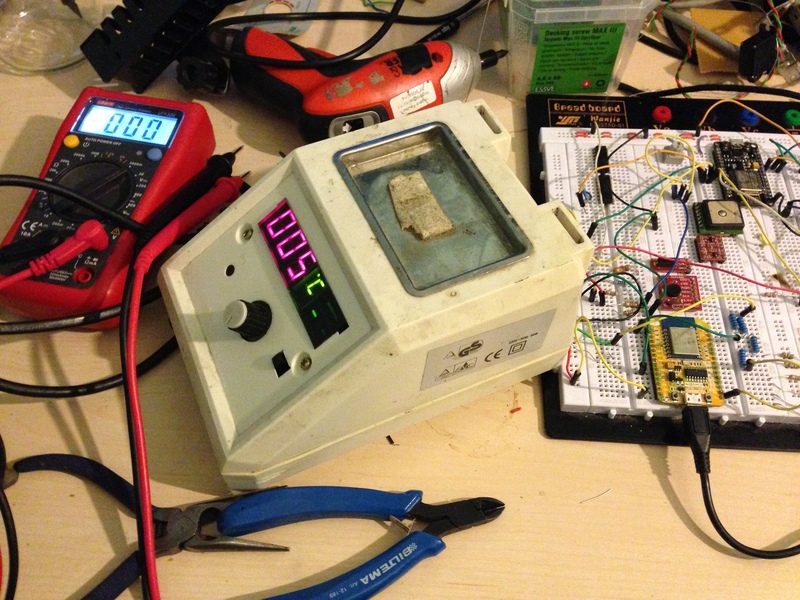 ThingSpeak user, Spencer, adapted a humidifier that sits in his basement. He is solving a common issue about humid basements. If your dehumidifier fails, you get wet things you have stored and then mold. Spencer created a humidity board using the DHT22 that measures humidity and then reports the data to his ThingSpeak Channel via the ESP8266 Wi-Fi module. Once the data is stored in ThingSpeak, he uses ThingSpeak React to update Twitter when things get out of whack. RunnerHam Tweets his distance and time when he takes a run on his wheel, “I’m done! 57.62m at 0.61m/s”. You can also check out his ThingSpeak Channel where he records lots of data about his day. Ángel also released an Instructables explaining his “pet project” so you can make your own and make your own enhancements. Just imagine what you can do with some sensors, connectivity, and ThingSpeak Web Services! Over the past few months, we have seen the ESP8266 Wi-Fi Module take the DIY Internet of Things makers by storm. The main reason is the ESP8266 is less than $5US includes Wi-Fi connectivity and the ability to be programmed like a microcontroller. Another trend that we are seeing is that many of the ESP8266 modules are being connected to ThingSpeak web services. We are getting a lot questions every day, so we wanted to setup a new forum in our ThingSpeak Community dedicated to the ESP8266 Wi-Fi Module. Feel free to ask questions about ThingSpeak support with your ESP8266, we will do our best to provide answers and solutions on how to get the ESP8266 up and running quickly with ThingSpeak. Everything you need to know in order to build your own sensor logging project is on Noel’s Instructables.